The Aram Soba Orchestra was founded by Maury and Josh Blanco in 2014 with the goal of reviving the songs of the Aleppo community in a form that appeals to the contemporary listener. 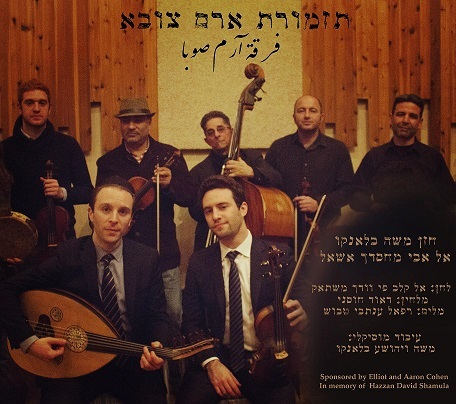 The orchestra focuses on preserving the pizmonim of Shir Ushbaha Hallel Vezimrah, particularly those written to the adwar of Egypt and Syria. In an effort to portray the beauty of these works to the modern listener, the orchestra arranges them to convey their full array of dynamics, with a twenty-piece ensemble of ten instruments and ten singers. By recording these treasures in a contemporary form, The Aram Soba Orchestra makes this beautiful art accessible once again. May this project provide a taste of the music of the past, and may it assist in bringing the songs of old to the ears and lips of the new.